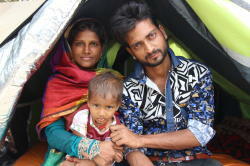 For six years, a married homeless couple were separated and forced to live apart in Delhi, India. The husband was in one gender-segregated communal shelter and the wife in another. Last year, for the first time, they were able to move into their own “home”. Their new “home” is a tent, designed by Singapore-based, non-profit organization billionBricks. The tent can be set up by one person in 15 minutes without any tools. It is weather-resistant, offering protection from the city’s extreme temperatures which can range from 5 - 45 degrees Celsius (40 - 115 Fahrenheit). It is also spacious, with the ability to fit a family of two adults and three children. The couple even moved in a bed, explains billionBricks founder, Prasoon Kumar. The lack of adequate housing across the world is a huge problem, with the United Nations estimating that there were approximately 100 million people homeless in 2005, which was the last time a global survey was done. Many more die as a result of exposure to extreme temperatures. 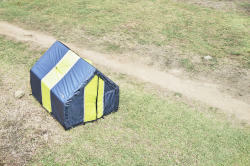 The Singapore-designed weatherHYDE tent is made to be weatherproof. In the winter, the tent’s triple-layer, reversible cover provides insulation, while reflective material on the inside retains body heat. 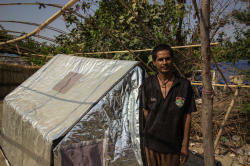 Conversely, in the summer, the other side can be used to reflect solar heat and help people inside the tent stay cool. 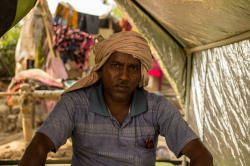 “But that is only one of the benefits a weatherHYDE tent offers over other typical communal shelters and tents,” said Mr. Kumar. Apart from battling the elements, the weatherHYDE tent provides more privacy because the triple-layer cover also blocks out light, so shadows from movement inside the tent cannot be seen. Its setup is easy and does not require anchoring to the ground with tent pegs, making its use possible in urban settings (areas often hit by natural disasters). Its unique design has attracted global attention. In July of last year, videos about the tent garnered more than 23 million views within a month of being posted online. Even celebrities shared the videos. Well-known Hollywood actor Ashton Kutcher called it “innovation at its finest” and rapper Lil’ Wayne said it “could save millions of lives”. Last year, billionBricks also launched a crowdfunding campaign on Kickstarter and raised more than S$145,000 (just over 100,000 USD) in two months, enabling them to provide 500 tents to needy families. The tents cost S$279 (199 USD). The 500 pre-ordered tents are expected to be shipped from China to India and the US sometime this July. 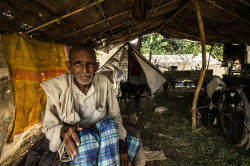 billionBricks, in its application for the internationally-acclaimed A’ Design Award’ stated that the tent “does not provide a poor solution to the poor; it provides a dignified solution”. The tent went on to be named one of 12 winners in the Social Design category in 2015. Meanwhile, there have been several refinements to the tent’s design since the married couple gave it a test run. There are new locking mechanisms and both sides – not just the non-reflective layer – are now waterproof. billionBricks has also relaunched its weatherHYDE website (www.weatherhyde.org), with a section where donors can type in a tent’s unique ID number to learn more about the homeless family who received the tent they donated. 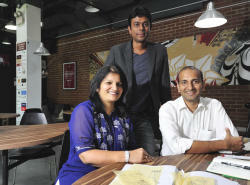 Beyond providing shelter, billionBricks also hopes to offer jobs to the needy. They are in talks with US groups to create jobs for people with disabilities to have them manufacture the tents. The organization has several sponsors, including DBS Bank’s corporate foundation, DBS Foundation, and Singapore-based design firm Space Matrix. Mr. Kumar hopes to continue to raise money through the weatherHYDE e-commerce platform, where the tents can be purchased and donated on a buy-one-give-one model and shipped anywhere in the world.